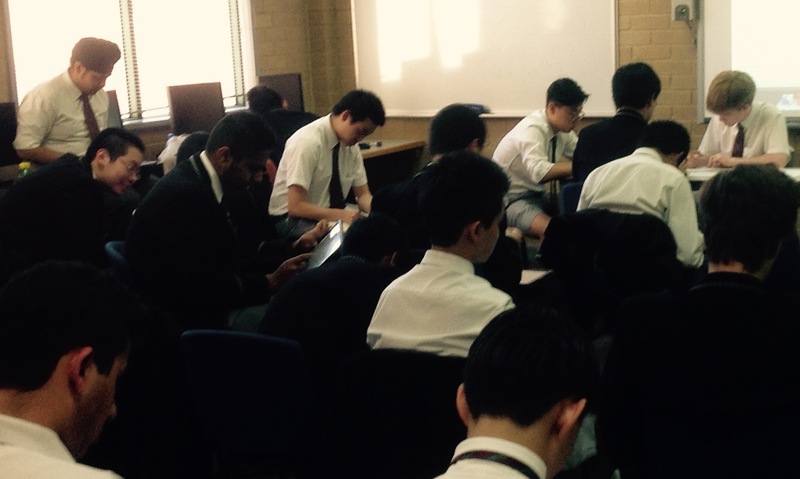 A huge thanks to Zac and his co-captains, Will and Eeshan, for today’s first meeting for the year. Brilliant job, I think you’ll all agree. Welcome to you all, especially the new year 9s, and hope you enjoy this year. I’m pretty excited about it, and I’m looking forward to seeing this little writing community evolve. Hopefully everyone enjoyed the writing prompt – it’s fun having everyone write from the same prompt within a time limit. Those of you who were generous (brave) enough to leave your writing with me for blog publishing, here they are. Zac and Will did a great job of emphasizing the value of feedback in the process of writing, so these are obviously short sketches and not polished pieces. The pieces are nameless but if anyone wants me to add their names, let me know and I’ll edit the post. By the way, reader, bear in mind that these were written quickly with no drafting process, and I’ve transcribed them without any editing. Keeping this in mind, and the fact that, given more time, everyone would have fixed up things like tense consistency, etc., it’s great to see the blog as a place to share the process of writing. Feedback is most valuable during the process, and not so much once the writing has been completed. A man walks into a bar and sees a teenage boy with filthily combed-over hair and large black glasses nervously take a seat. The boy looks around nervously, as though to check that nobody knows that he should not be there. “How’s school going, son?” the man asks, sitting next to the boy and swivelling, brimming with confidence. “Do I know you?” the boy asks, all traces of his former nervousness gone. “No, because this is not competition writing”, the man replies, standing and moving quickly to the door, a gust of cold winter air the only sign that he had ever been there. Time’s up! A man walks into a bar and sees a stout tradesman sipping his Jack Daniels next to his usual red stool. His fluorescent uniform and shaggy beard prompts a roll of eyes from the approaching man, Jeff. “I’ll have the usual, ” Jeff says to the bartender as the tradesman leaves. “Don’t worry about it,” the bartender says as Jeff slipped a finger into his pocket. That nice man’s got you,” she explains. Jeff screws his face up in astonishment, then… Time’s up! A man walks into a bar and sees it’s out of business. There were no customers entering or leaving apart from Mike. He was an alcoholic and a usual at the bar. The bar had a long counter in the centre and seats and a stage to perform. Mike had a friend who was also a saxophone performer. He would greet him every time he was there but today Mike only saw the waiters. Mike walked towards the stage and noticed a $100 note jammed between the door to backstage. Mike reached forward to open the door and noticed the knob was burning hot. Slowly he opened the door and there he saw a blazing fire with a trail of money leading outside the window. Time’s up! The well known tune of “Amazing Grace” rung through his ears. He had just got off the train from Hamburg. He wasn’t from Hamburg. He turned up in Berlin one day under the guise of a tourist. Olive skin, thin and straight dark brown hair, impeccable German with a light Munich accent. He had been all around Germany, and Austria, Russia, Britain, France, Nepal, China, Japan, India. He looked no older than 25. He dressed like a classic Turkish street ruffian. His physique imposing, his eyes colder than ice. He was on the most wanted list for reasons unknown to anyone. He walked down the cobblestone. It was late – there weren’t any cars. The shadowy character walked into the bar, and he finally found what he had been looking for for the past 16 years. 2015 Competition Writing. Time’s up! A man walks into a bar and sees some familiar faces chatting happily and accompanied by a beautiful woman he doesn’t yet know. Evading being noticed, the man hastily walks towards the bar, takes a seat and orders a gin and tonic. As he takes his first sip and sees the group out of the corner of his eye, memories come gushing back. Little P. playing with his new train model, signing father’s day cards and sporting a look of disappointment. He was now bigger than the man himself and sported a smart sports coat and pale grey shirt. He saw his beloved D, their futile fighting and ultimate split. The man stared into his glass, wondering how he could have ever let go of those he once held so close to his heart. Wiping away a tear, the man nervously approached the table. He could not tell if their faces were from mere shock or disgust. Time’s up! The ambiguous figure lumbered across the silent darkness consumed by rigid shadows of his surrounding cityscape. The eerie night engulfed by the faint humming of the lean and fatigued street lamps, a dying light flickers and fades in the distance. Shadowy sign whose light pierces through the abyssful oblivion of night. One could barely make out the facing “Bar” which looms on the sign. Suddenly a towering shadow floats past the beacon of guidance and the torch in an atmosphere of ominous obscurity. A soft creek echoes through the Time’s up!